Bumpy Highway : Felix the cat. R.I.P. Hello and welcome to my Blog, my name is Chris, a bus driver for First Mendip based in Wells, Somerset. Married to Fiona, we live in Midsomer Norton near Bath, with Harvey the dog and Boots the cat. My main hobby is Amateur Radio and I hold the call sign G4KVI. I am the repeater keeper for GB3UB and MB7UB. I have a fascination for the weather and all things to do with nature and science. I am a biker and currently ride a Honda CBfF600. As a Christian I worship, when shifts allow at St. Nicholas Church in Radstock. These are my observations on my life, both at work and at home. Just returned from the vets having done one of the hardest things a pet owner has to do. 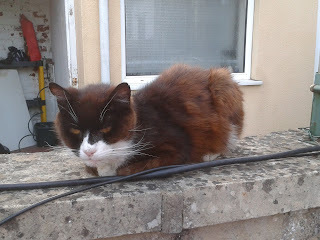 Felix our, at least 19 year old cat has been put to sleep. Over the last couple of days I thought he was getting clumsy but on further examination turns out his sight had gone. Fiona and I made the decision that should this day arrive we would not let him linger on and let him go with some dignity. However, still an extremely upsetting thing to do. The vet said there was no real treatment and that it would be the kindest thing to do. He had a great life and we had some great fun with him I believe he is in a happy place now still trying the catch mice and birds and I also believe we will see him again. So mate it has been a great at least 19 years so rest easy. Is there more to life than this? Black Friday, Cyber Monday Shop Safely! This blog is now closed ……. Would Vettel or Alonso be more deserving champion?